I may be the only person in the state who still adores the old wild multiflora roses that blanket many farms, but when it comes to wild cactus, I'm right there with the rest of them--despising it. 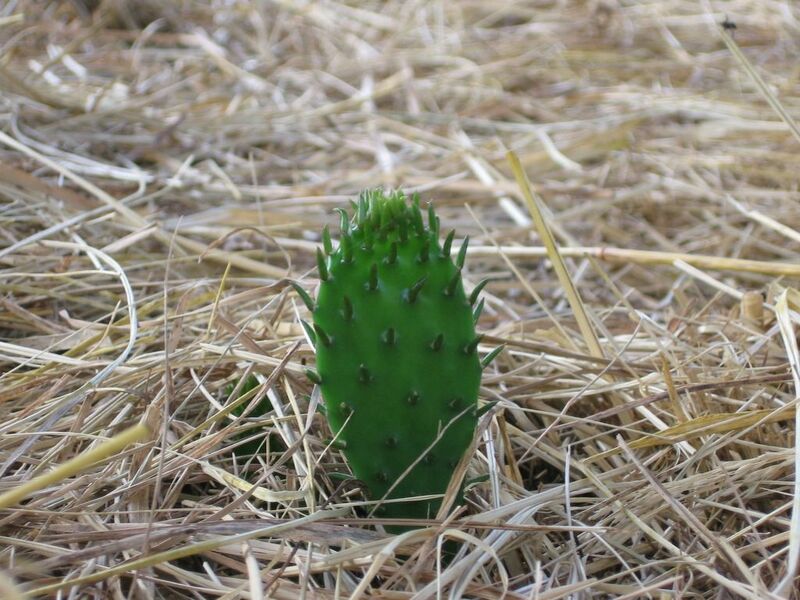 Prickly cactus is just about the last thing you want growing in your fields, and the stuff just refuses to die. I will admit that the flowers are lovely, although the first (and last) time I said this out loud, Joe (a diehard cactus hater) almost choked to death. (Good thing we weren't eating.) And after being down on my hands and knees in the middle of the hayfield (and in the middle of the very exhausting job of loading up a field full of haybales onto the trailer) on a 90-something degree day last year, carefully pulling up pieces of cactus, hands bleeding (yes, I was wearing gloves), sweat pouring down my face, a feedsack of cactus on the bed of the truck, and enough to fill about 25 more feedsacks still on the ground. . . Well, I now understand the choking episode. You see, even if you rip the cactus from the ground. Even if you toss it somewhere like the middle of the gravel driveway. Even if you leave it on the back of the truck laying on just the tiniest bit of dirt--the stuff will come back to life. It can grow anywhere. . . Even from out of a year old bale of hay. The first of this year's hay is cut and teddered. Today it will be raked and baled, and then we will drive around and pick up the bales. Since we never got around to The Winter Cactus Pick Up Project in the hayfield last year, I have a feeling we wil be seeing those nasty spiked leaves everywhere. Let's hope not. At least the flowers are pretty. Just please don't tell Joe I still think so. I did not know that about cactus. I struggle with english ivy growing everywhere. It is also difficult to eradicate. This is one of those rare times when I'm not too envious of your farm life, because of the really hard jobs you have. I can't imagine that I would even last 15 minutes trying to load hay bales on a trailer in 90 degrees with bleeding hands from the prickly weed cacti. I hope Cary was in the shade nearby ready to make you smile, and most of all, I hope you had a nice long refreshing bubble bath afterwards. Have you thought about eating the cactus pads? They are called nopales in Mexico and they are delicious. Very nutritious but a little bit tedious to prepare. We have a lot of prickly pear cactus and we eat from a couple of choice plants. Right now I have two paper bags full of pads to process and put away for the winter. Angela is right, nopales is great..eat your weeds! Oh, and don't forget to try the fruit, too... Lovely name of Tuna (where did THAT come from, I wonder? ), and they are so sweet and juicy. I'm sorry they are such a pain to get rid of-that sounds like a never-ending chore. Holy crap!! I knew the state was called 'Misery' for a reason... is there anything that you could graze in your hayfield for a short while that would eat the cactus? Maybe goats? (I dunno, I'm a city slicker, so I'm probably way off base with that suggestion). Good luck with the raking and baling! I love those woodsy roses...but draw the line at cacti! bleck! I just wrote about some of my farmgirl days on my blog ;) You might appreciate it. 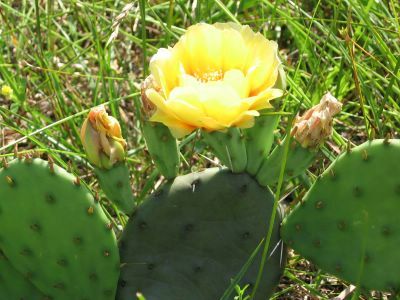 Well, I recently discovered the only prickly pear growing in my forest, and I was delighted by the discovery. I don't suppose it will spread much, and I don't really have any other use for the land anyway. OK, one person's trash is another person's treasure ?!!!? They're beautiful! I did not know that they grow wild here! Bring me some for my pathetic bunny-ravaged garden! I'm looking for something that is difficult to eradicate! Planted 15 chocolate mint plants, English ivy, and am now ready for some killer cacti! The Cacti are beautiful and I'd love to have some to plant here. I am a plant murderer (not by choice) so I need something that will survive on its own. Our old prickly pear caved to the ground last week. The base had been hacked several times by a weed eater and the top was just so heavy that it finally succombed and retired to the ground. We wanted to move it anyway, so this is a good thing. We'll relocate some small new parts and get rid of the older dead or dying parts. They're quite resilient so I know we'll have another large cactus in no time. Once I saw the picture, i said to myself: "¡Un nopal, güey!" (translated to English is something like: "Dude! That's a nopal!"). Then I went directly to the comments on this post and surprisingly found that more than two people, who I'm assuming are not mexican, knew about nopales and told you to eat them. But my surprise couldn't be more when I read that marie told you to also eat Tunas, the fruits. Well, I'm mexican, and as angela, steven and marie said, nopales are delicious. In Mexico, nopales are one of the most traditional dishes. You can prepare them in a pleyade of ways. It's said that a nopal is as nutritious as a steak. But one warning shall I give to you and all of the other readers of this posts: beware of Tunas, eat one or two at a time, and avoid eating them if you suffer of constipation. Tunas are delicious, and very fresh and juicy, but eating a lot of them can cause a somehow severe constipation, so enjoy them, without excess. N.B. Nopales don't cause the same effect, you can eat them without restriction. If anyone is interested in nopales, tunas, some recipes that inclde them, or mexican culture in general, inspired by this post I've just created a new blog and I'll be very pleased if you visit it and comment on it. In Madeira Island, (Portugal)were I live, we eat the fruits of this kind of cactus, that we call "tabaibeiras". We must be careful todo it. With gloves, we cut the bottom and the top of the fruit with a knife, and then we make a vertical cut. Then we open and, inside, there is the fruit. You may eat it at once, but if you put it in the freaser, it's better. Sorry for my english, but I hope we untherstood me. I used to live in a neighborhood with a lot of Hispanic families. The LOL next door adopted me and brought me breakfast nopalitos, with eggs and chiles. Man, those were delish. I wish I'd gotten the recipe. Of course, now that I've moved, I don't have the cactus anymore.